Witness the power of local! Straight to Ale’s inaugural STAlocal campaign is proud to announce the launch of our very first community collaboration brew – TropiLocal Belgian Wit! TropiLocal is a twist on a traditional Belgian Wit beer, cutting back the standard orange peel and using more lemon, and adding a dry hopping once fermentation nears completion. The brew will launch with a release party in the Straight to Ale gym on July 24th, 6-9pm, featuring live music from The Note Kickers - a 3-piece funky instrumental band with Hunter Copeland on guitar, John Onder on bass and Scot Holder on drums. 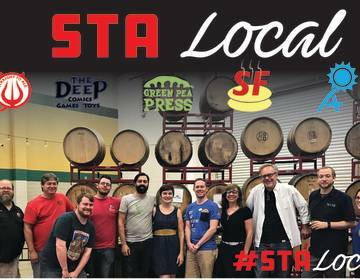 Green Pea Press, Energy Alabama, The Deep Comics, and Startlingly Fresh Records came together to create a brand-new beer from start to finish and will be joining us to celebrate the public release of the beer at Straight to Ale. Green Pea Press will be printing shirts for the specialty brew on site, and Energy Alabama will be raffling off an Ecobee Smart Thermostat! Each organization will also have tables set up with their own merchandise and information available. The goal of the STAlocal campaign is simple – work with local community organizations and artists outside of the brewing industry to come together and create a brand-new beer. Collaboration and community are at the heart of Straight to Ale, and we are looking forward to bringing people who inspire us into the brewery and sharing in our passion of brewing great beer. Join us July 24th at 6pm in the gym to celebrate community, collaboration, and craft beer at the launch of TropiLocal Belgian Wit. This free event is located at Straight to Ale, 2610 Clinton Avenue in Huntsville.